"This book is a modern, up-to-date view of the biochemical background of Parkinson's disease. 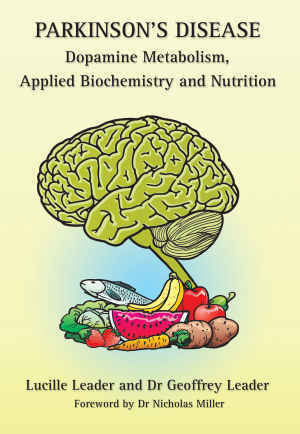 It uniquely presents the application of individualised biochemically-based nutritional science to clinical practice. It will be of great interest to clinicians, nutritionists, students and people experiencing the symptoms of Parkinsonism"
"It is apparent that there are significant nutritional considerations in the management of Parkinson's Disease"
This groundbreaking, user-friendly monograph clearly illustrates the various metabolic and biochemical pathways implicated in Parkinson's Disease, with their primary sources in protein, carbohydrates and fats. It describes the enzymes necessary for metabolic and biochemical progress with their dependence on co-enzymes, which are specific nutrients. Biochemical tests are described to analyse cellular status so that management of Parkinson's Disease will incorporate, as adjuvant care, not only pharmaceutical management but also nutritional support of metabolic and biochemical processes. This would be based on the biochemical individuality of patients. Dopamine, the neurotransmitter which is deficient in Parkinson's disease, is metabolised from dietary protein. The metabolic steps from protein ingestion in the diet to the production of dopamine in the brain - and further on to adrenaline, are best described by biochemistry. Contemporary nutritional management is the APPLICATION of biochemical principles.